April 10, 2019—The following press release was issued by Rep. Marcy Kaptur (D-Ohio) yesterday. It puts back on the Congressional agenda one of the urgent actions required to curb Wall Street speculation, and put the United States back on the path of the American System. Rep. Marcy Kaptur introducing her Glass-Steagall bill in the last Congress. The Bill number is HR 2176. It has 25 cosponsors, all of whom are Democrats. 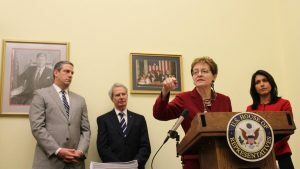 Washington, D.C. — Congresswoman Marcy Kaptur (OH-09), the House’s longest serving woman, led a group of 26 House members to introduce the Return to Prudent Banking Act of 2019, legislation that would reinstate and expand the historic provisions of the Glass-Steagall Act of 1933 restricting affiliations between commercial and investment banks. The legislation has been endorsed by AFL-CIO, the International Brotherhood of Teamsters, Communications Workers of America, International Federation of Professional and Technical Engineers, Public Citizen, and Take on Wall Street. “In the wake of the Great Depression, Congress worked on a bipartisan basis to pass the Glass-Steagall Act to separate commercial banks and securities firms and prevent Wall Street from gambling away the American people’s hard-earned money. Tragically, the Big Banks and their lobbyists pressured Congress to repeal the law in 1999. This misguided deregulation opened the floodgates for growth of financial institutions that are too big to fail and encouraged the type of risky behaviors that led to the crash of the American financial system in 2008. While we made significant progress when President Obama signed the Dodd-Frank Act, large commercial and investment banks are still tied together in an institutional risk that threatens the financial well-being of our country. I urge my colleagues to join me in passing this vital legislation so we can ensure the security and stability of our financial system,” said Rep. Kaptur. “The same Wall Street banks that crashed our economy in 2008 and put millions out of work remain too-big-to-fail to this day. We need to ensure that our members’ and our retirees’ livelihoods aren’t jeopardized again by the reckless behavior of a Wall Street megabank. The Return to Prudent Banking Act is a smart solution that would reinstate the barrier between commercial and investment banking and make our financial system safer. CWA fully supports the Return to Prudent Banking Act and we thank Rep. Kaptur for her continued leadership on this important issue,” said Shane Larson, Director of Legislation for Communications Workers of America. “Public Citizen enthusiastically welcomes Rep. Kaptur’s much needed bill to restore prudence to the banking industry. Because Congress repealed the ban on banks owning casino-like securities gambling operations in 1999, it took less than a decade for reckless conduct funded by government-backed deposits to crash the world economy,” said Bartlett Naylor, Financial Policy Advocate for Public Citizen. “There is nothing inevitable about Too Big To Fail. We separated investment and deposit banking for decades, and Glass-Steagall was very effective at preventing the banks from becoming the unmanageable monoliths they are today. Congresswoman Kaptur’s Return to Prudent Banking Act would restore the guardrails for the big banks, and go a long way toward making them manageable again,” said Porter McConnell, Director of the Take On Wall Street Coalition. FDR signing Glass-Steagall in June 1933. The Glass-Steagall Act was signed into law in June 1933 following the 1929 stock market crash and subsequent Great Depression. The legislation separated commercial banking from investment banking while creating the Federal Deposit Insurance Corporation (FDIC). The purpose of the legislation was to restrict the use of bank credit for speculation and instead direct bank credit into commerce, industry, and agriculture. In 1999, the provisions that restricted affiliations between banks and securities firms was repealed by the Gramm-Leach-Bliley Act. The repeal of these important provisions contributed to the Great Recession. The Return to Prudent Banking Act amends the Federal Deposit Insurance Act (FDIA) to prohibit any insured depository institution from being an affiliate of any broker or dealer, investment adviser, investment company, or any other person or entity engaged principally in the issue, flotation, underwriting, public sale, or distribution of stocks, bonds, debentures, notes, or other securities. Prohibits officers, directors and employees of securities firms from simultaneous service on the boards of depository institutions, except in specified circumstances. Requires any such individual serving as an officer, director, employee, or other institution-affiliated party of any insured depository institution to terminate such service as soon as practicable after enactment of this Act. Requires an insured depository institution to wind-down in an orderly manner and terminate any affiliation prohibited by this Act. 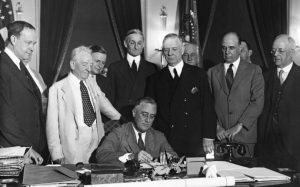 Amends the Banking Act of 1933 (Glass-Steagall Act) to expand its prohibition against the transaction of banking activities by securities firms. Declares that Congress ratifies the interpretation by the Supreme Court of specified statutory language in the case of Investment Company Institute v. Camp (ICI) regarding permissible activities of banks and securities firms. Declares that the reasoning of the Court in that case shall continue to apply to the limitations placed upon security affiliations under the FDIA as enacted by this Act. Prohibits a federal banking agency or federal court from issuing an interpretation regarding such security affiliations that is narrower than that of the Court in ICI. Makes technical and conforming changes to the Gramm-Leach-Bliley Act, the Revised Statutes of the United States, and specified federal law. Requires the Board of Governors of the Federal Reserve System, the Comptroller of the Currency, or another appropriate federal banking agency to report to Congress a detailed description of the basis for its decision each time it makes a determination or grants an extension concerning an affiliation between insured depository institutions and investment banks or securities firms.